After a longer-than-expected interlude I resumed the tour on Monday, 25th June at Carlisle, travelling up from Lancaster by train that morning. I entered Northumberland on the 685 from Carlisle, crossing the county bondary at a fairly anonymous point on the A69 main road between Brampton and Haltwhistle. The bus was busy from Carlisle and amongst the passengers were a group of Americans travelling to Haltwhistle and who were quite concerned that they might somehow miss it. "Say, when we get to Haltwhilstle, will there be a sign saying "Haltwhislte"?" When we reached the town they stayed on the bus until we were almost out the other side (it's not a big place) and then alighted on the eastern edge of town. 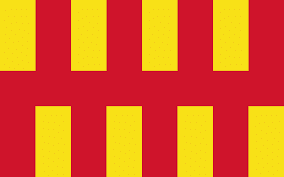 Northumberland is a case where the county town, Alnwick, is neither the largest city (that's Newcastle-upon-Tyne) nor the administrative centre, which is Morpeth, although Newcastle and its surroundings are outside the jurisdiction of Northumberland County Council. Alnwick is the county town probably because it is the traditional home of the Earls of Northumberland and would have been where the county's representatives in parliament were chosen in medieval times as well as being the centre of justice for the county. The town dates from the 7th Century, whereas Northumberland County Council was only established in 1889 and was located in Morpeth largely due to that town's more central location to centres of population. Newcastle-upon-Tyne, whilst geographically in Northumberland has had its own, separate administration since the 15th Century. I'd intended to travel all the way through to Newcastle on the 685, a journey of over two and a half hours. But as we arrived at the mid-way point of Hexham we overtook a bus on the "X85" "Newcastle Express". This seemed a better bet so as we were in front of it when we got to the bus station I abandoned the 685 and transferred to what I hoped would be the faster bus. We followed the 685 out of town, but lost sight of it after Corbridge when we remained on the main road and it turned off to serve the village of Throckley. We never saw it again but I noted that our actual arrival time at Newcastle was identical to the scheduled arrival of the 685. Newcastle's bus stations are quite upmarket. We arrived at Eldon Square, where I was able to buy lunch at Waitrose, whilst my next bus left from Haymarket which was just across the road but could only offer Marks & Spencers! Arriva offers a selection of limited-stop services northwards from Newcastle. On my previous visit to the north-east when I went Around the Edge of England, I avoided Newcastle itself by using the Tyne ferry and then used the X20 from near Ashington. I planned to return from Alnwick on the direct X15, so that left the X18 via Amble as the obvious choice. By now, it was obvious that I had chosen one of the hottest days (in fact weeks) of the year for my journey so I was glad that the X18, like most buses, has eschewed air-conditioning in favour of hopper windows that can be opened to let fresh air in. These are frequently a source of dispute between passengers with differing views as to fresh air and draughts, but today everyone was in agreement! Running about ten minutes late, we left Newcastle past the Town Moor where "The Hoppings" where one of Europe's largest gatherings of travelling showmen present the annual fair and where they were getting ready for the day's entertainment. I'm a great fan of travelling fairs, although these days my main interest is in the classic British lorries (ERFs and Fodens are favourites) that the showmen use for haulage and power supply. We continued up the old A1 "The Great North Road" through congested Gosforth before joining the modern dual-carriageway version for a fast run north to Morpeth. At Widdrington Station (which has become a community in its own right, remote from the actual "Widdrington" village) we joined the route of the X20 that I remembered from my previous trip. The village of Alnmouth looked very appealing across the estuary when viewed from the top deck and I was looking forward to seeing ore of it, but the X18 turns round at the very edge of the village due to the road layout so Alnmouth will have to wait until another day. Arrival at Alnwick was more-or-less on time at 1503 and just 4h 48m from Carlisle. Alnwick is famous for its castle, which I didn't visit as it was too late in the day, and for its Tenantry Monument, which I did. The monument was supposedly erected by "grateful tenants" of the 2nd Earl of Northuberland after he had cut their rents at a time of famine. The tourist office says there is no truth in the story - but repeats it anyway - that when the momument was completed the Earl thought that if the tenants could afford to build it they could certainly afford to pay the higher rents - so he put them up again! It even has its own model railway running through the shop. Fortunately, I was travelling light so I couldn't buy anything, which given the prices was a blessing in disguise.